It is the discrepancy between the front edge or plane, and the back edge or plane, that is the primary content of the work. This discrepancy sets up an agitation with the wall and gives the paintings a somewhat unsettled physical appearance. Edel Assanti is pleased to present Tony DeLap’s first solo exhibition in the UK. Tony DeLap’s artworks challenge the limitations of visual perception, exploring the point at which the illusion of threedimensionality becomes reality. 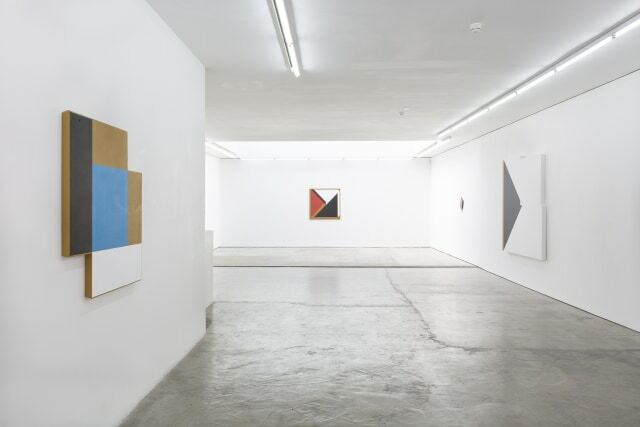 DeLap has been at the nexus of significant West Coast American art movements since the early 1960s. His exhibition at Edel Assanti focuses on work produced over the past decade of his career. Despite playing a key role in the development of many of the dominant movements of twentieth century abstraction – including minimalism, op art and hard-edge painting – DeLap’s oeuvre intentionally eludes fixed categorisation. His recent work exists at the intersection of painting and sculpture: monochromatic shaped canvases and hard-edged abstract paintings. DeLap’s work investigates how the interaction of geometric shapes can create dimensionality and movement on static planes. His paintings are visually non-referential, containing the essential compositional architecture to create an effective illusory space. Their pristine and textureless surfaces play a critical role in this process, achieved through a combination of the densely layered application of acrylic paint and a saturated palette, maximising the retinal impact of the interlocking planes of colour. DeLap has emerged as one of the leading practitioners of perceptualism, a sensibility in West Coast American art which was identified by Robert Irwin as an interest in examining the stability of human sensory experience. It is therefore unsurprising that whilst he was one of only three artists included in both the landmark exhibitions of Op Art and Minimalism in the 1960s, (The Responsive Eye, 1965, Museum of Modern Art, New York; Primary Structures, 1966, Jewish Museum, New York) the totality of his oeuvre fits into neither context. DeLap’s wide range of interests – encompassing phenomenology, architecture and magic – continue to shape the formal and intellectual evolution of his art, defiantly challenging the ocular limits of perception of form and dimension. Tony DeLap has exhibited extensively since 1963. His work resides in the permanent collections of Tate Modern (London), Museum of Modern Art (New York), Solomon R. Guggenheim Museum (New York), the Whitney Museum of American Art (New York), San Francisco Museum of Modern Art (San Francisco), Los Angeles County Museum of Art (Los Angeles), and Musée cantonal des Beaux-Arts (Lausanne, Switzerland) among many others. DeLap has been included in such landmark exhibitions as American Sculpture of the Sixties (1967, Los Angeles County Museum of Art, Los Angeles), and in 2018 the Laguna Art Museum mounted a major retrospective of DeLap’s work dating from 1961 to present, curated by Peter Frank. DeLap taught for over thirty years at both UC Davis and Irvine, influencing a generation of artists including Bruce Nauman and James Turrell. DeLap lives and works in Orange County, CA.